There are no violent tensions between Indian and Chinese army on the border. China hasn’t attacked India with rocket missiles, as claimed by Pakistani channel. Please share the news as civil tensions could arise in India and many innocents could be the victim of planned propaganda. There is no war between India and China as of now. The war is less likely to happen as India and China both understands the fact of coexistence. Moreover, over the last 3 years, China has invested a lot of money in the Indian market which is another reason of giving business ties importance over the boundary disputes. DunyaNews TV Pakistani channel is famous for its third class news reporting in Pakistan. 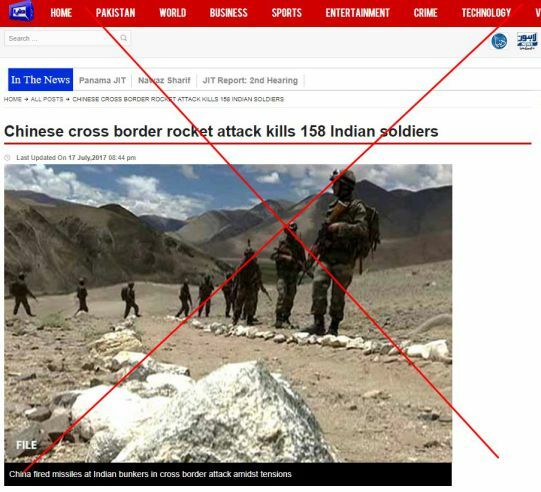 When experts believe of a scientific solution of Indo-Sino border conflict, Third Class reporters of Pakistan Channel Dunya News TV ran a fake report demolishing all standards of journalism. Not just journalism, such report have shamed the entire humanity. The news portal shared the images of tanks burning in fire, these images are fake as reported by Indian Express, one of the prime channel indulged in exposing Panama Papers. In reporting of the channel, its claimed that the report is being published from Sikkim. Forget about Sikkim, Dunya News TV didn’t have a single branch in entire India. The religious hate can be clearly noticed in the report run by the channel. We request all the concerned authorities including Google News to immediately remove the portal for sharing such irresponsible news on their website.